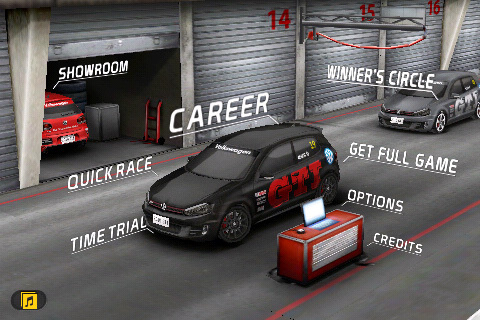 Volkswagen and Firemint’s Real Racing GTI free promotional game for the iPhone has been released to the App Store. The 59.3MB download offers a Volkswagen branded racing experience with one main track and six 2010 GTI sport hatches. The free Real Racing GTI App is available worldwide and spares no detail, allowing players to experience every thrilling aspect of the all-new 2010 GTI right in the palms of their hands on iPhone and iPod touch. From the redesigned exterior with more aggressive headlights and the famous red-striped grille, to the sporty interior with a race-inspired steering wheel, the all-new 2010 GTI races its way to life on the screen for a thrilling gaming experience. The three game modes include Quick Race, Time Trial, and GTI Cup Championship (across three tracks). Aside from being a great ad for Volkswagen, Real Racing GTI also serves as the Lite version of Firemint’s widely acclaimed Real Racing [$6.99]. As part of the launch promotion, Volkswagen is giving away six limited edition 2010 Volkswagen GTI MarkVI prize cars to six U.S. players of the game. Details of the giveaway will be posted at http://www.VW.com/RealRacingGTI. We loved the full version of the game, so this free Lite version is a “must try" for anyone who hasn’t played the game yet.